I listened sporadically to an old episode of “Tornado Talk” last month while cleaning my son’s room to help soothe the anticipation for the upcoming storm season (only 2 months left for me now!). 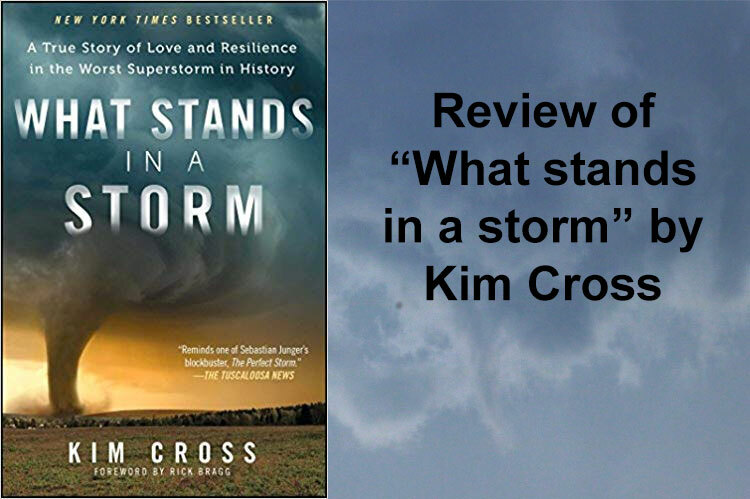 In the episode they talked with Kim Cross about her book “What stands in a storm”. I didn’t pay that much attention to it but I put it down on my “ro read” list together with “Storm chasers” by Jenna Blum. I just finished reading “What stands in a storm” – and thought I’d share a review of it. To be honest, I did not really know what to expect when I bought the book. I knew that it was about the April 27 2011 tornado outbreak in Alabama but very little about the author, whether it was a popular book etc. I was in for a treat. “What stands in a Storm” takes an extremely ambitious aim at telling the story of what happened on April 27th 2011 and the people it affected. Kim shares an in-depth perspective on a few selected victims and others whose lives changed forever that day. We get to follow meteorologist James Spann from his childhood to this terrifying day as well as the people who perished and their families. We also get to follow the weather pattern as it develops and wreaks havoc. After the storms have settled, we finally learn about the aftermath, the sorrow and how catastrophes like this brings people together. I won’t leave it to the end to tell: This. Book. Is. Amazing! I was caught from Page One and could hardly leave the book. What Kim does with this book is to add flesh and souls to the casualty number of that day, which is such a beautiful and meaningful work. I mean, we have all heard the casualty number from an event but every person that makes up for that number is a person who has touched other people’s lives, is someone’s son, someone’s sister or someone’s loved one. This is not a surprise, but still something that is often forgot. In “What stands in a storm” Kim puzzles together the last hours in a few selected tornado victims’ life. It is absolutely heart breaking to read. Following a mother and share the exact moment she realizes her daughter is dead or the father who sits on a lawn chair by his son’s house until his body are retrieved from the rubble is just incredibly painful. There were numerous parts of the book I was reading with tears running down my cheeks. The lives depicted have been written with such care and so vivid that you share a tiny part of the sorrow the loved ones are going through. The weather events are also explained in a way that explains the storms in a poetic but still very understandable way. I know most of the physics that lies behind a tornado but I still picked up a thing or two, or at least gained a new perspective. In another podcast I listened to Aussie storm chaser Daniel Shaw talking about how he was one storm chaser before Joplin, MO, 2011 and another after that tragedy. Most storm chasers (fortunately) never see that part of the storms and really understand the suffering “our” beautiful tornadoes cause. We know they do, but I don’t know to what extent we can actually feel it. For that reason, this is such an important book because it tells the story of the people who lived in that house which you saw the roof getting ripped off in that “Shocking, epic, must-see video” that passed by in your social media feed. What stands in a storm can be bought on Amazon from about $10. Do your self a favor, buy it and read it before this season! It is the perfect book to read while on a storm chasing tour, before your storm chasing trip or on the flight over to Oklahoma. It will give you a new, and much needed, perspective on the tornadoes you are (hopefully) about to witness.